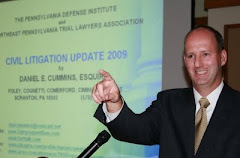 On May 24, 2011, Judge Terrence R. Nealon of the Lackawanna County Court of Common Pleas issued a decision in the case of Erie Ins. Exchange v. Soroka, No. 09 - CV - 1056 (Lacka. Co. May 24, 2011, Nealon, J.) which involved the UIM coverage exclusion for non-owned, regularly used vehicles. In Erie Ins. Exchange v. Soroka, a partner of a used car dealership partnership was injured while driving one of the dealership's inventory vehicles. After securing settlements under the tortfeasor's liability policy and the UIM benefits under the dealerships "Garage Form Auto Dealer" policy, the injured party turned to his personal auto insurance policies with Erie Insurance for additional UIM benefits. Erie had issued a "Family Auto Insurance" policy to the injured party and his wife as well as a "Commercial Auto Insurance" policy to the injured party's wife. The injured party sought UIM benefits from his personal policies on the grounds that he did not regularly use the particular dealership vehicle that he was operating which was intended for resale to a customer rather than personal use by a partner. Both of the Erie policies excluded UIM coverage for injuries sustained by an insured while operating “a non-owned motor vehicle…which is regularly used” by the insured, but not expressly insured for UIM coverage under those policies. In his Opinion Judge Nealon noted that, in the case of Brinkman v. Erie Insurance Exchange, the Superior Court of Pennsylvania interpreted the “regularly used” exclusion in question as precluding UIM coverage if the insured is injured while operating a vehicle that is contained in a fleet or pool of non-owned vehicles to which the insured had regular access. After reviewing the facts of the case before him, Judge Nealon ruled in Erie Ins. Exchange v. Soroka that since the record clearly demonstrated that the partner had unrestricted access to the partnership’s inventory vehicles for business or personal use, or in other words, since the vehicle was regularly available for the injured party's use, the injured party's claim for UIM benefits under the family and commercial auto policies is barred by the non-owned, “regularly used” vehicle exclusions contained in those policies. As a result, the insurer’s motion for summary judgment was granted in this declaratory judgment action and the insureds’ motion for summary judgment was denied. Judge Nealon's opinion is noteworthy for his thorough analysis of the development of the standard of review for the application of the "Regular Use" exclusion. Anyone desiring a copy of Judge Nealon's decision in the Erie Ins. Exchange v. Soroka case may contact me at dancummins@comcast.net.